Students and the community came together on Thursday to beat the longest line of surfboards, previously 685 in Long Beach, New York in May 2016, by a whopping total of 880 boards. All the correct procedures were followed, all the boxes ticked, and forms filled out ready to be submitted post-event. The School and students were raising both funds and awareness for the Disability Surfers Association (DSA) through the sale of raffle tickets and other activities on the day, such as a sausage sizzle and baked goods stall, while the band Crystal Cities capped of the day with a few tunes. The final count on how much the world record breaking effort raised isn’t in but it was well over 5 thousand dollars as Issue 305 comes out. Disability Surfers Association (DSA) is a not-for-profit, total voluntary organisation which sets world’s best practice for Disabled Surfers and puts "Smiles On Dials" at events all around Australia and New Zealand. DSA was established in 1986 by Gary Blaschke after a motorcycle accident which he lost his knee cap and under went extensive rehabilitation. Gary saw a void that needed to be filled as over the years, many surfers with disabilities have unfortunately, been loners with no one to help them get back into the water. Many suffer from disabilities that the general public would not consider a disability. From asthmatics to joint injuries to paraplegic, many members have found friendship, support and have renewed their interest in surfing. Gary’s vision quickly extended to all classes of disabilities, as it is today. A total voluntary organisation, which sets world’s best practice for Disabled Surfers, DSA also advocates for people who want to get in or on a wave and works with local organisations to spread the joy surfing brings. From early morning people could see students walking to school with their boards, not that an unusual sight in Pittwater, only some were carrying more than one. Mid morning the call went out that more boards were needed and more boards were brought – Manly Surf School not only do they teach our kids to surf but they brought a trailer of boards down, Simon Ward of Adrenalin – Redback (Warriewood) making two trips to bring 101 boards and Onboard Store (Mona Vale) also bringing more along. This type of event gives the students a community minded focus while fostering pride in their school. Our aim is to germinate in the minds of students a focus away from themselves and into the greater community in a fun and interesting way that directly relates to the environment we live in. Ian Bowsher, Principal at Barrenjoey High School stated on Friday that the event had taken 9 months of hard work and planning by a great team. 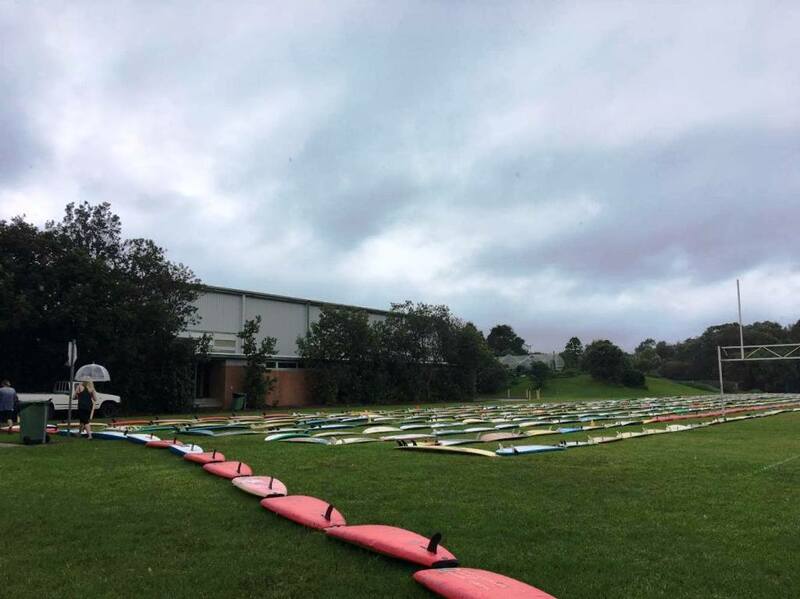 “The weather might have been overcast and rainy but that didn’t stop Barrenjoey High School. 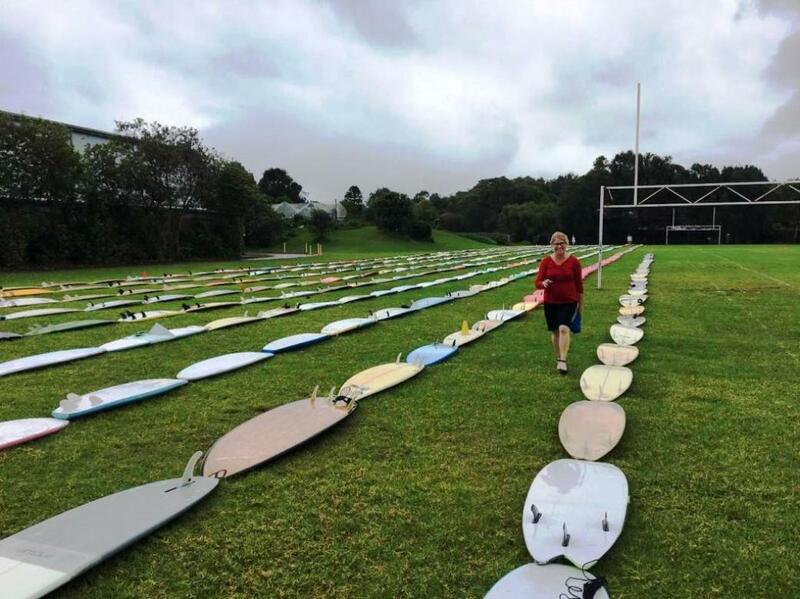 “My role, along with Leeanne Kelly from Northern Beaches Council was to count the number of surfboards and to ensure they were laid end to end. 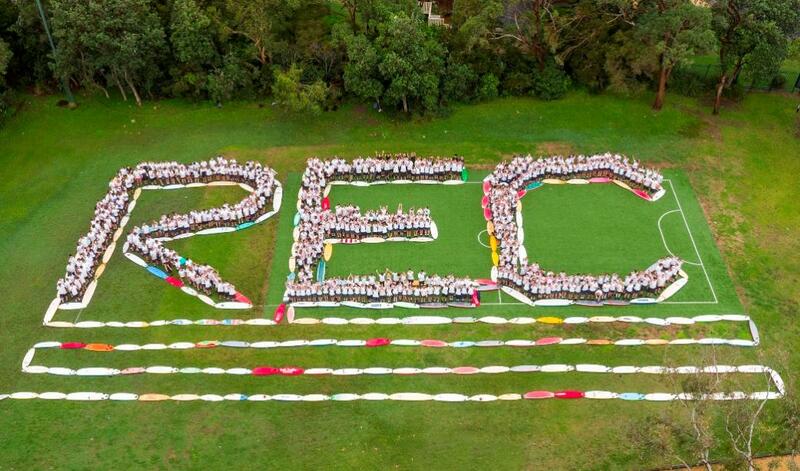 “ Well done students, teachers, parents and friends of Barrenjoey High, for breaking the record! Congratulations on a wonderful effort!! “ Kylie Ferguson said after the event, still smiling. In this students respect the subjects they study, the content, teachers, environment and themselves, where effort is expected, valued, recognised and celebrated and where students see the worth in challenging themselves to ‘be the best they can be’. 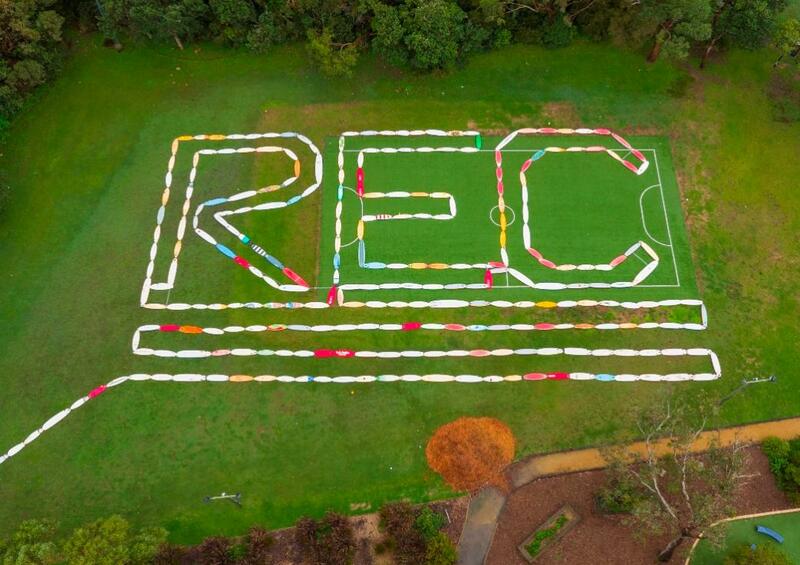 This isn’t the first time Barrenjoey High School students, their parents and all in the community have worked together to do something great – The SRC chooses a charity each year to support. In previous years they have supported RUOK? and the Asylum Seeker Resource Centre. Teachers have participated in Movember in 2014 and 2015, calling their team ‘Barrenmoey’. The Barrenjoey Band provides the music for the hymns, while their Principal, students and School Captains attend Avalon Beach RSL ANZAC Day Commemoration Services every year. What great students, parents and a fantastic community! In 2018 the school will be celebrating its 50th anniversary. With alumni that are still doing their bit in and for the community, as well as those who have excelled in the Arts, Science, Sports and every career and trade available, as well as being great mums and dads, this will be a great community event for all ages too. At present the school is running a ‘Buy a Brick’ campaign to fund the building of the Barrenjoey Community Performance Space – there’s that word ‘community’ again! The Barrenjoey Community Performance Space will provide a purpose built, architect designed amphitheatre which will support the vision of the school leadership to better showcase the talents of our students and the wider community. Tax deductible donations can be made to the schools Building Fund via the Treasury at Barrenjoey High School or online via their website. Wouldn’t it be great if the 50th year of Barrenjoey celebrations could include the announcement of being on the threshold of placing another space and place for all to meet in, as a great community, too?